Chelsea legend Dennis Wise says he’d love to see his old club pursue the transfer of Leicester City striker Jamie Vardy. 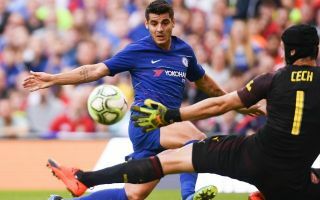 The former Blues captain admits Alvaro Morata has been ‘disappointing’ in his time at Stamford Bridge so far, though he also wouldn’t rule out the player improving on a tough first season in the Premier League. Morata, 25, only scored 15 goals in all competitions last term, and only 11 in the Premier League. That is certainly far from good enough for such an expensive player at a club with ambitions like Chelsea, and it’s something of a surprise CFC have failed to bring in anyone new up front this summer. There isn’t long to go as the Premier League transfer window slams shut at 5pm tomorrow, but Wise suggested Vardy as the ideal player to come in. The former England international is a big fan of his goal-poaching qualities and attitude, and it’s hard to argue with him – even if the Foxes front-man would likely only be a relatively shot-term fix for that position. ‘I wouldn’t have minded trying to get Vardy if there was an opportunity, because I think he’s an instinctive goal-scorer. Whether or not it’s a little bit too late now is another thing,’ Wise told talkchelsea. ‘What you want – you want someone who’s got no fear. He’s the kind of player who’s got no fear. On Morata, Wise added: ‘Let’s not count Morata out. It was his first season. Yes he was disappointing, but he now understands how the Premier League is. Which of these realistic strikers would you sign for Chelsea? None - keep faith in Morata!